Everyone is cashing in on the latest Pokemon craze including Bandai who is releasing a special Eevee Tamagotchi in Japan. If you missed out on the 90s, you'll remember Tamagotchi are little pocket devices where you raise a digital pet. In this case it's an Eevee. Like Tamagotchi's other virtual pets, you'll be tasked with feeding and caring for your Eevee and praying for the love of all that's good in the world it doesn't die. To be perfectly honest while death is a natural stage of life in a Tamagotchi, we don't expect death to be a factor in this Eevee one. Call it a hunch, but we figure at worst the Eevee might faint. Do well enough and your Eevee can evolve into one of its many different Eevolutions: Vaporeon, Flareon, Umbreon, Glaceon, Jolteon, Espeon, Leafeon, or Sylveon. You can see there are three mystery variants. There's also a chance to hatch a unique Eevee. It's unclear what these are yet but there's apparently a chance to get a unique Eevee variant. Serebii is reporting something like a Ditto Eevee, or an Eevee wearing different clothes. News of Eevee's Tamagotchi debut coincides with the launch of Pokemon Let's Go Pikachu & Eevee which is out now for the Nintendo Switch. Check out our Pokemon Let's Go review or our Pokemon Let's Go guides to learn more about this adorable entry into the Pokemon series. Japan is on a roll currently launching products to coincide with big Nintendo releases. Just yesterday it was revealed Amazon Japan is selling a massive box of 63 amiibo for Super Smash Bros. Ultimate. 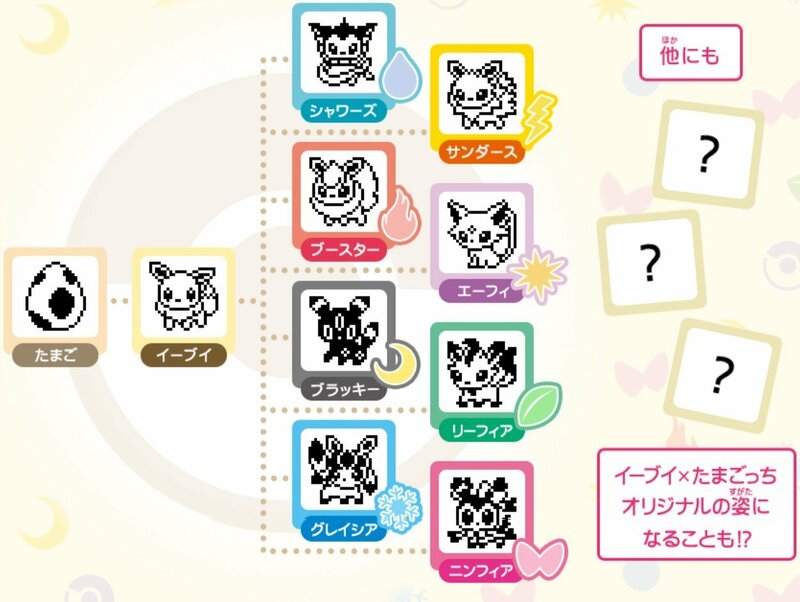 The Eevee Tamagotchi is out on January 26, 2019 in Japan. No word of a US release. Tagged with Bandai Namco Entertainment,	News,	Nintendo,	Pokemon,	Toys.